Or is that two words? Or not words, according to spellczech. No matter. I usually get about three sentences into a yarn about yarn when my non-fiber friends interrupt incredulously, with something like “What in the world is a niddy noddy? Did you make that up?” No, I didn’t. I would never give something so useful such a silly name. 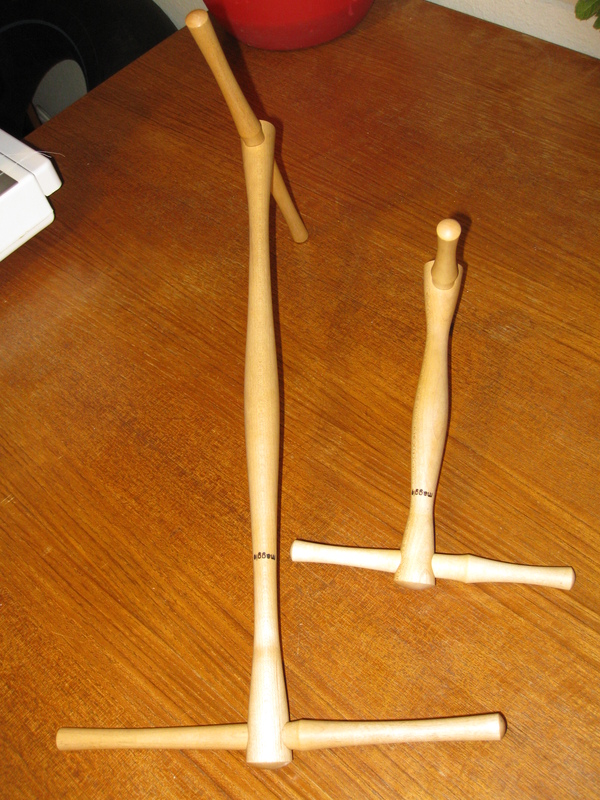 My big 2 yard niddy noddy, and my little sample niddy noddy. Niddy noddies are spectacular tools. They allow you to wind your yarn off a bobbin into a skein in regular, countable lengths. Every loop around my big niddy noddy makes two yards of yarn. See, you don't have to let go to wind...brilliant. The loose yarn over my hand is wound down and left, up and back, down and right, up and front. And, they come with a quaint rhyme. There are theories that the name and the rhyme evolved at the same time, both owing their distinctive rhythm to the way the head of the niddy noddy dips up and down as you wind. And so on…until you get to 50. At 50, you’ve wound 100 yards into a skein. Winding more will distort your length estimate, as the yarn is wound over the ever-increasing bundle of yarn already on the niddy noddy. 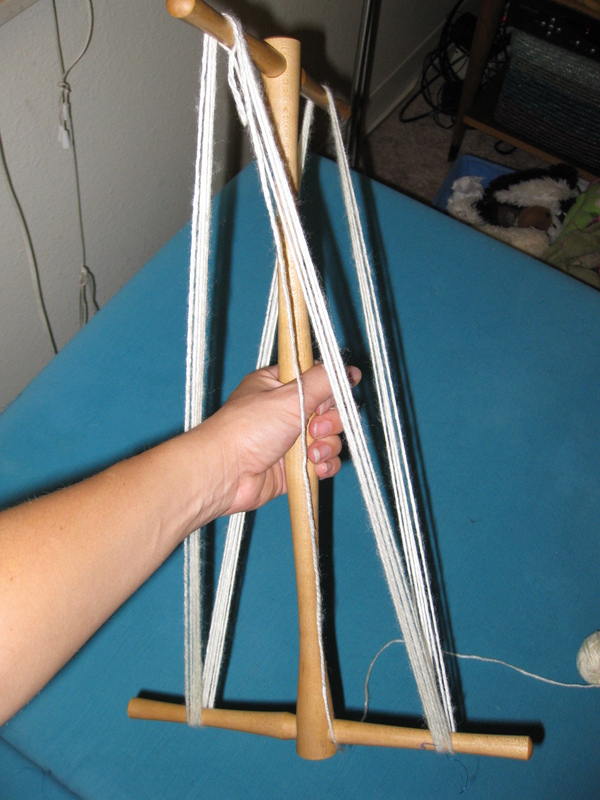 The arms slide right out of the main shaft, and the skein comes off easily. Yarn is easiest to wash and dye in skein form. Until I became a spinner, I cursed skeins as impossible to unravel into a workable ball, but now I know skeins show the yarn best and don’t put unnecessary tension on it. Wow. WordPress had a seizure on the spell checking in this one. T’will is a word, t’isn’t it? This entry was posted in fiber art and tagged fiber, niddy noddy, word of the day, yarn. Bookmark the permalink.